I had been quite busy to manage several things in August. I was in Seoul to attend the closing party for this exhibition I curated for Roland. Roland and I met in Cork, Ireland, of course, at the Guesthouse, which I wrote a lot about here. 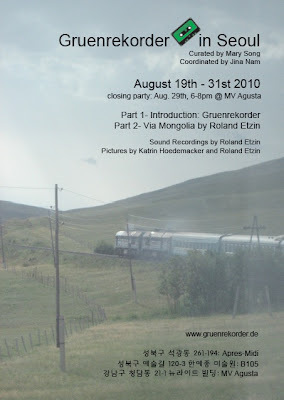 Our connection came to all the way to Korea to this exhibition, and finally made it as a form of exhibition of sound art. Perhaps, the short introduction of the exhibition might help you understanding why I started thinking about this exhibition. 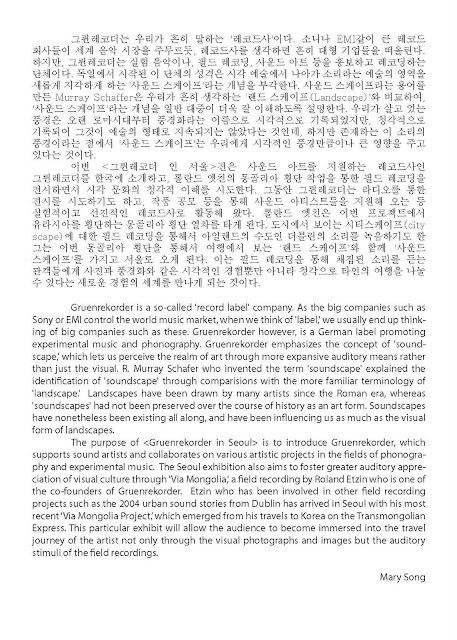 I was very glad that Roland could experience all the sound artists in Korea through SAII, thanks to Ji Yeon, thanks to Young's help for Roland, great coordinating by Jina, thanks to our sponsors, Apre-midi and MV Augusta. Above all, thanks to Katrin and Roland who travelled from St. Petersburg to Seoul by train most of the time. We look forward to listening to the new sound soon again!